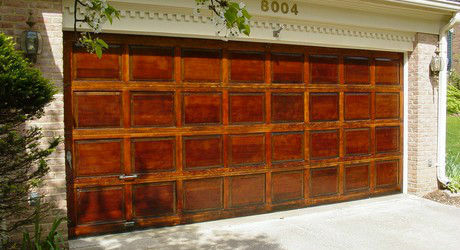 This garage door had become badly weathered throughout the years. 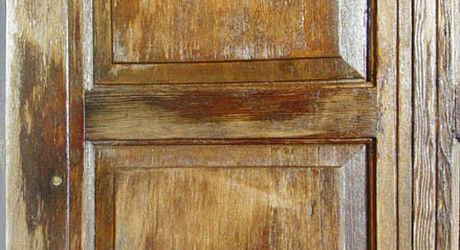 The door faced continual exposure to afternoon sun, which caused significant deterioration in the finish, leading to chipping and yellowing. 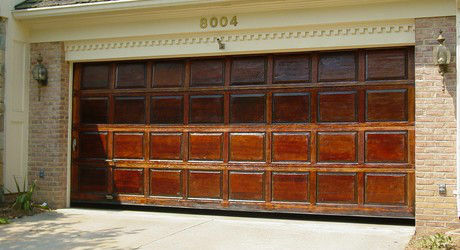 This mahogany door had severly weathered, and the absence of its spar polyurethane was leading to discoloration from the sun and the elements. 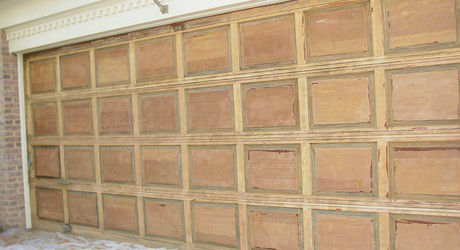 The restored had been stripped of its old finish, residue removed from its panels and moldings, sanded, cleaned, and restored to its deep red-brown color. 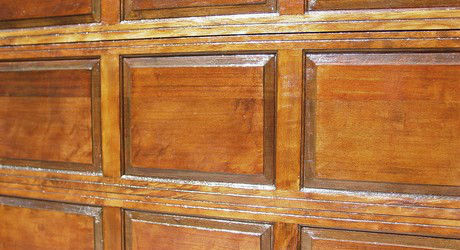 No staining was required except for tint matching in spots that were highly weathered. The objective was to match the garage door to the front door. However, because the exposed wood was so red and porous, this was made considerably more difficult. In addition, it appeared that the vertical door elements may also have been made of a different wood (a red oak), which meant different stains would be employed for tint-matching purposes. The door was stripped with belt sanders, palm sanders, hand sanders, and lastly with fine dremel tool work in all the beveled panels. Stripping liquids were also used in the panels. 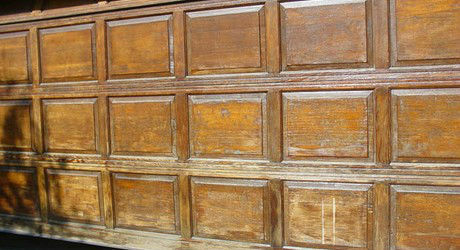 We were able to achieve a very clean surface for the subsequent staining (in highly weathered areas only) and restoration. The garage door was further weatherized with clear exterior siding caulk in areas where cracks were present. Lastly, the door trim was repainted in a matching cream color. 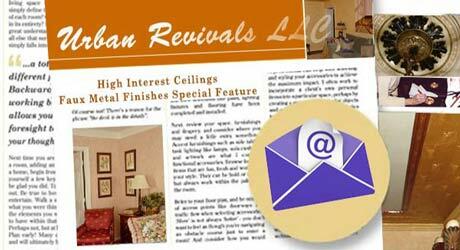 Get the latest news on faux finishes for walls, floors, doors, and ceilings. Be inspired by guest writers, special deals, and photos of new techniques for antiquing, color glazes, & fantasy finishes. Straight to your email inbox! While the selective staining could not remove all the color disparities, it went a long ways to restoring uniform color to the door. Four coats of spar marine-grade polyurethane were applied.